In his book The Demon-Haunted World (reviewed here), Carl Sagan notes the clarity of the original paper in which Albert Einstein introduced the theory of Special Relativity. But even if Einstein’s language was spare, cautious and clear, it was still technical -- too technical for readers not versed in physics. Compare this with the text of Darwin’s The Origin of Species. Just like Einstein’s paper, this was the first presentation of a theory that, in many ways, changed the world; each of the two is one of the most important scientific theories ever presented. Just like Einstein’s paper (which was titled “On the Electrodynamics of Moving Bodies”), Darwin’s book is written in a clear and enjoyable language. But unlike that paper, The Origin of Species is approachable by any reader, even with little or no background in biology. The idea of reading Darwin’s original introduction of his theory might sound strange, even pointless. After all, the theory was greatly advanced since it was first introduced; and there are numerous popular-science books on the subject (such as Richard Dawkins' excellent The Blind Watchmaker, among many others). So why read a text that is both dated and technical? One good reason is historical interest: both in Darwin himself, and in the history of the theory of evolution. But there’s another reason, just as good: The Origin of Species is a good introductory text to the theory. True, it is somewhat outdated, in particular in the complete lack of reference to the mechanism of inheritance. This is not surprising, since genetics were not known at the time. But on the other hand, unlike most modern introductory texts, it assumes absolutely no prior knowledge (or preconception) on the theory. From examining the variations of domesticated animals (and in particular pigeons, which he had researched extensively), Darwin moves to the question of variation in nature, and to the principle of Natural Selection. His arguments are almost always clear and forceful, but of particular interest is Chapter VI, “Difficulties on Theory”. Here, Darwin enumerates the various challenges presented to this theory, some of which are in use even today -- for example, how could “organs of extreme perfection”, such as the eye, develop by chance and in minute steps; the imperfection of the geological records; and so forth. No such argument is ignored or belittled, and all are presented with surprisingly robust answers. For me, it was entertaining to learn that many of Darwin’s original answers are still relevant today, and how little the arguments of evolution’s opposers have advanced. Darwin readily admits that his theory is just that: a theory, and in several points speculates about specific discoveries that, if indeed discovered, could prove it wrong. Two opposing theories are discussed: one is Lamarck’s doctrine, which is briefly mentioned and proved wrong with a simple yet brilliant example relating to neuter ants. The other is Creationism (though obviously it is not referred to by this name, which appeared much later). 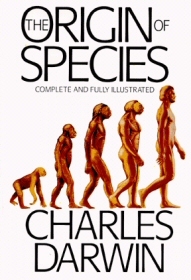 In several places throughout the book, Darwin provides examples of natural facts (for example, relating to the distribution of animal and plant forms in nature) that are easily explained by evolution, and completely unexplained by Creationism (except by exclaiming “this is how God willed it to be”). I believe that all animals have descended from at most only four or five progenitors, and plants from an equal or lesser number. Analogy would lead me one step further, namely, to the belief that all animals and plants have descended from some one prototype. But analogy may be a deceitful guide. Nevertheless all living things have much in common, in their chemical composition, their germinal vesicles, their cellular structure, and their laws of growth and reproduction [...] Therefore I should infer from analogy that probably all the organic beings which have ever lived on this earth will have descended from some one primordial form, into which life was first breathed. The text I’ve read is a reprint of the first edition of The Origin of Species. Five additional editions were published later on, but many claim that the first edition is, in fact, the best one, since in later editions Darwin had toned down his arguments in various fields (most specifically with regard to geology, and the age of the Earth). The copyright on The Origin of Species has long since expired, and it is available for free download from Project Gutenberg.